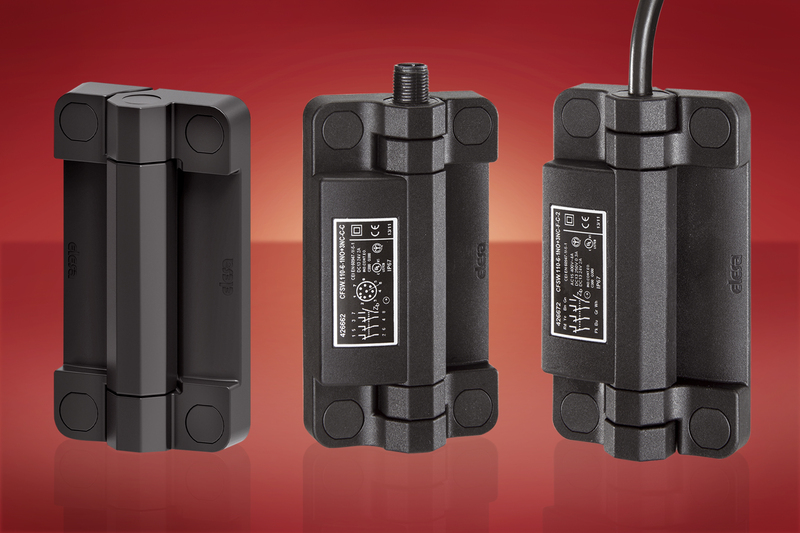 Combining multiple functions has many advantages for installers and operators so that the Elesa CFSW-110 IP67 180° hinge has been designed with its own built-in multiple safety switch, in order that in the event of accidental opening of a control cabinet door, machine panel or safety door, it automatically shuts off the power and protects the operators of machinery and production equipment. The CFSW is paired with its equivalent mechanical hinge, the CFMW-110 which facilitates a tough, safe installation. The CFSW is double insulated and approved by IMQ CA02.04800 in compliance with EN 60947-1/2007 + EN 60947-5-1:2004 + A1/2009. Low voltage control auxiliaries. Approved by UL: E360222.l. It is available with different combinations of contacts with positive opening (2NO+2NC, 1NO+3NC etc). These robust units are tested to a B10d value of 2,000,000, are totally tamper-proof, and may be quickly and easily installed. Standard connections are 8 pole connector or 8 core cable in 2m or 5m lengths. 180 degree opening is normal but other operating angles may be specified. The Elesa website provides extensive user guidance for installation, configuration and operation.